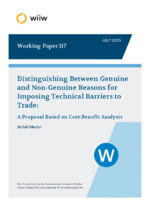 This contribution provides a cost-benefit analysis in a partial equilibrium framework to investigate the welfare consequences of a prohibitive non-tariff measure (NTM) aimed at a foreign product with perceived negative characteristics. Two groups of consumers are distinguished: one that is indifferent to the negative attributes of the foreign product and another that is concerned about them. Different scenarios concerning the welfare gains from the introduction of an NTM are explored. The results depend on consumer awareness and information policies pursued by the government. The theoretical model is illustrated with data on the consumption of cattle in eight northern states of the United States of America; this is related to Dispute Settlement 384 on Certain Country of Origin Labelling (COOL). The findings suggest that when the government informs consumers after an NTM that a harmful product is no longer available on the market, that favours domestic producers rather than consumers. Such a framework could assist the Dispute Settlement Body of the World Trade Organisation in determining the true motivations behind the imposition of an NTM.